Want to look gorgeous? Want to look stylish? Then you have come to the right place, our guide best designer laptop bags for women will help you to choose the right bag at the right price. Our society is male dominated. Everything is built keeping men in mind, although women dominates 51% of the market. I as a woman so much upset with that, but now days are changing. Companies and advertiser are focusing on us. Designing product especially for women. Honestly speaking, most laptop bags and handbags are boring corporate drone-looking with a little bit of touch. That doesn’t mean you can’t find a good looking, gorgeous and stylish laptop bag or handbag that is easy to carry and will add value to your professionalism. So today I brought a wide range of best laptop bags for women collection, which will make you feel luxurious and under your budget. The Women’s Work Horse Tote Bag from Haiku is going to be your one and only work tote bag. It is not only stylish with these bright fun colors, but it is completely functional laptop tote bag for women. Haiku Women Work Tote gives you two options to carry it. You can either carry it using top handles or you can use removable cross-body strap that comes with a padded area for added comfort. At the front of the bag, you will have a roomy zippered pocket for small items and a large pass-through strap that is perfect for housing your jacket or yoga mat, which is very handy when heading towards the gym. Underneath that, there is an awesome hidden zippered pocket where you can keep things that you don’t anyone to have easy access. On the backside of the bag, there is a roomy open pocket that comes with a zipper at the bottom allowing you to make it a pass through strap for attaching it to a wheeled luggage. So you carry Haiku laptop bag smoothly on those business trips. The main compartment unzips at the top, and it is nicely lined as well as spacious. It has an organizational section on the front wall including a zippered pocket; it even have a card slots and a key fob for holding your keys. On the other side, you will have padded laptop area that comes with a hook and loop Velcro strap to secure your laptop. It can house laptop up to 15 inches with ease. Haiku Women Work Horse Tote is made of hundred percent Cycle Pet Polyester Fabric with water resistant lining and coating. It is definitely one of the best designer laptop bags for women. 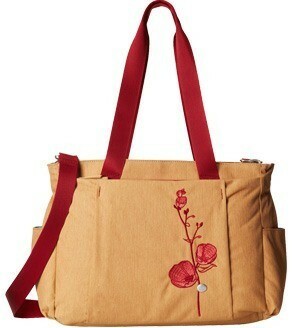 Q.1 Does this tote bag for women includes any water bottle or umbrella pockets? Answer: Yes, of course, it includes a water bottle and umbrella pocket on either side. Q.1 Is it a water resistant work tote bag? Answer: Well, yes, It includes water-resistant lining and coating for the safety of your essentials. For those who are looking for a combination of brain and beauty in a laptop bag, a designer laptop bag is best option. Among all the designer laptop bag on this page, the best one is Haiku Women Work Horse Tote. It will replace your old-fashioned laptop bag and be your one and only work tote. Whether you are going on a business trip or just organizing your everyday life, this lightweight travel tote bag from Baggallini has the place for everything you will need. 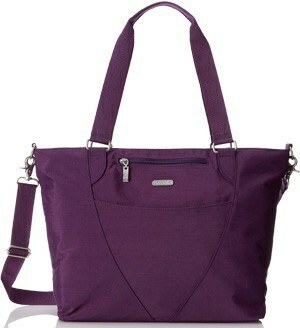 Baggallini Avenue Travel Tote Bag is crafted from hundred percent nylon along with polyester lining. On the front side, you will have exterior sleeve pocket that comes with convenient clear ID holder. Top of that you will have a small zippered pocket perfect for storing items that you need an easy access, for example, your cellphone would be ideal for that. On the other side of the bag, there is a zippered pocket that has lots of storage space perfect for housing bulky items. This pocket also includes a zipper on the bottom so you can quickly make it luggage handle pass-through pocket. The main compartment access is protected with a zipper. Inside you will find a gorgeously lined interior. On the back wall, there is a zippered pocket and few open sleeve pockets to keep your small items nice and organized. 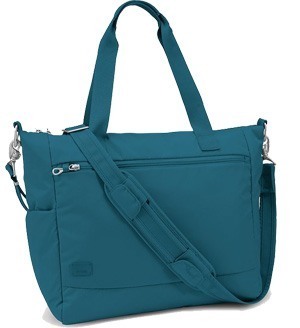 Baggallini Avenue Travel Tote also includes 15.5-inch Laptop compartment that comes with a hook and loop strap. The Laptop compartment includes plenty of padding to keep your laptop safe and secure. The great thing about this designer laptop bag for women is you have the option to carry it as handbag using these dual carrying straps, or you can use the detachable shoulder strap to carry it as a shoulder bag or even a cross-body bag. Top handles as well as cross body strap. Q.1 I own 17 inch MacBook Pro, Will it hold my laptop? Answer: Unfortunately, This tote bag is designed for 15.5 inches Laptop, so it will not fit. You can check out this 17 inch Laptop Bags Review post. Q.1 Does this tote bag comes with any interior organization section? And: Yes, of course, and it is located on the back wall of the main compartment. Pacsafe Citysafe Anti-Theft Travel Tote is the most versatile and functional travel laptop tote bag for every other woman. It will make your every trip more enjoyable with its durable and super organizational features and some mind-blowing anti-theft features. Pacsafe Anti-Theft Travel Tote is made of nylon material and stainless steel wire with eXomesh slashgurad on the lower front, side, and bottom for added security from the thieves. There are two top carrying handles along with the removable and adjustable shoulder strap that is also slash proof to prevent the criminal from cutting the strap and taking your bag. The shoulder strap also includes a padded area for additional comfort. Pacsafe Anti-Theft Travel Tote features a front pocket with smart zipper security for quick access storage. The main compartment access is protected with a zipper closure and open to reveal a beautifully lined interior. Inside you will find a padded sleeve that can accommodate a laptop up to 13 inches or even an iPad/Tablet. On the opposite side, you will find a zippered pocket, a sleeve pocket, and pen holders. There is also an RFID-safe pocket which blocks identity scanner from retrieving your information, for example, your credit card details or passport details. And on the side, it has a water bottle or umbrella pocket. Now you can travel in style and carry everything you need safe and secured in this fabulous new bag from Pacsafe. Q.1 Can I use this tote bag as cross body bag? What is the drop of shoulder strap? Answer: Yes, you can use it as a cross body bag, the approx. Drop of the shoulder strap is 28 inch. Q.2 Will this tote bag hold my laptop and lunch? Answer: yes, of course, the main compartment has enough space for these items. Lindsay (BFB) laptop shoulder bag is one of the highly rated and top selling designer laptop bag for women. A woman designed this stylish and fashionable laptop bag for the business women. This bag can protect a laptop up to 17 inches such MacBook Pro, Dell, Sony, etc. It can also hold iPad and tablets. This designer laptop bag from Lindsay bag will give you a premium look. The design of this bag is so smooth, and the stitching are mind blowing. Lindsay shoulder laptop bag for women includes three areas. The center one is well zipped and padded to ensure the protection of your 17 inches laptop, iPad and Tablets. The zipper is stronger and thicker than any average zipper. The front area is for important document and papers and it also includes three small pockets to keep your cell phone, credit cards, pens, etc. And on the backside compartment, you have a zipper pocket. The two outer compartments have a magnetic closure which ensures the safety of your essential items. Additionally, this bag includes a clip for the key rings or chains. Now never lose your keys again. The gorgeous faux and the patent leather with a beautiful lining on the shoulder strap will give you relief from the shoulder aching. This bag is ideal for travel, lightweight and durable. And the bag can stand on its own, so packing is easy. This bag comes in two different colors: Black and Red. If you are looking for quality and design, then look no further this is the perfect bag that will fill all your need. This stylish laptop bag is a combination of beauty and brain. Q.1 Is it all leather? Answer: Yes it is and good quality. Q.2 Does it have any outside pockets? Answer: No! It doesn’t have any pocket outside. All pockets are inside. Q.3 Does this bag comes with a cross-body strap? Our second choice in best designer laptop bag for women guide is solo premium leather laptop bag that can easily carry a 15.6 inch laptop. This bag comes in espresso dark brown color that is very rich, so you don’t need to worry about your outfit because this color looks good with any outfit. Most of the times because of rain our hard work gets wasted. Sometimes our job gets in danger because of some low-quality, cheap laptop case which cannot keep them dry. But this laptop shoulder bag features premium leather and a padded compartment that ensures your paper and other electronics such as laptop stays dry and protected. The laptop compartment closes like an envelope and uses Velcro strap to protect your laptop. The interior design of this best leather laptop bag for women features blue lining and there is three open vertical pockets where you can put your iPods, glasses, pens etc. Also, this trendy laptop bag has metal feet on the bottom that protect your laptop and other electronic things. The straps of the bag are well designed and comfortable and have a great length. It is so attractive and cute that you will love to use it as your purse. You can easily carry your lunch and water bottle in the compartment. This bag can hold everything you need without being too heavy. Its feels so good when you have to carry only one bag. It is one of the best laptop bags for women in my humble opinion. Q.1 How heavy this bag is? Answer: This premium leather laptop bag is not heavy. It has the right weight 1.5 lbs. Q.2 Can I carry textbooks along with laptop? Answer: Yes, you can. This stylish laptop bag comes with lots of storage so you can easily carry all these together. Q.3 My laptop is heavy, how solid handles are? Answer: This laptop bag is made of premium leather so is its handles. So I think you won’t have any problem carrying your laptop. A stylish handbag is like a portable life for women. So we always need a bag that will protect everything we care about. This bag will fulfill all your expectation. Le Donne Leather laptop tote bag is your best designer laptop tote bag. First of all, this bag is a genuine leather handbag. It is made of genuine Colombian leather that ensures the durability of the bag, the stitching is perfect and the bottom corners are reinforced with more leather. At the bottom, Le Donne Leather bag has five metal feet’s. So this laptop tote bag can stand its own which ultimately makes packing super easy. The design of the bag is eye-catching. This bag comes in five different colors such as Red, Black, Tan, CafÃ© and Gray. These colors look good with any outfit. So I must say Le Donne got a good sense of color. Secondly, it will help you get organized. The exterior pocket of this bag is large enough to hold your phone, sunglasses, keys, etc. Inside the bag there are several other pockets for your important things such eyeglasses case, business cards, calculator, etc. 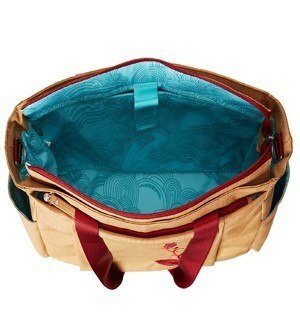 It also features a wide zippered pocket which will perfectly hold all our make-up items. The zipper of the main compartment is smooth and stable enough for daily use. The main compartment is divided into two sections. First one is well-padded which will protect a laptop up to 15.4 inches from any kind of damages and it uses Velcro straps that will reduce the impact of the sudden drop. In the second section, you can put your other material such as textbooks, documents, papers, etc. The handles are long enough to carry it comfortably. This cute laptop bag was designed for personal and professional use. It can hold everything you need for a business meeting or other situation. You will be so pleased with this bag that you would like to purchase another product of Le Donne. Made of genuine Colombian leather. Two different internal sections, one for laptop and another one for other essentials like Textbook, Magazines, etc. Q.1 Is it too heavy? Answer: No! It is a very lightweight leather laptop bag. Q.2 Is the leather soft? Answer: Yes! It is made of original Colombian leather. Q.3 What is the bottom panel made of? Answer: Original Colombian Leather! Same as the rest of the bag. This laptop tote bag is specially designed to protect a laptop up to 17.3 inches such as MacBook Pro. Mobile Edge Ultra Work Tote features extra protection from the scratch and moisture by SafetyCell. Your laptop along with other things will fit in perfectly. It will give you a professional look and will be comfortable on your shoulder. Straps have a good length even if you wear a heavy coat it will fit perfectly. This laptop work tote bag has internal and external pockets that are great features. These internal and external pockets are in different sizes, which helps you organize your essentials quickly. Mobile Edge Ultra Work Tote features a cute detachable cosmetics/accessories pouch. It has three different compartments and the laptop compartment is well padded. The Laptop is protected with a Velcro strap. 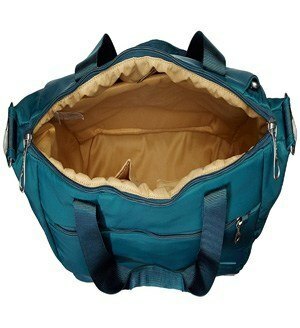 The Most interesting feature of this bag is removable laptop compartment. When you don’t carry a laptop, you just simply remove it. This will give more room for another purpose. 17.3 inches laptop fits perfectly, features extra protection from scratch and moisture by SafetyCell. Plenty of rooms and dedicated pockets for you other essentials. Q.1 What is the length of straps? Answer: It has a good 12’ inch drop. Q.2 Does the main compartment has zipper? Answer: Yes, the access to the main compartment is protected with a zipper. Q.3 Is this laptop tote bag good to carry legal files? Answer: Yes, This bags has enough room to carry all your legal files. If you don’t carry a laptop then you can remove it as it is removable so you will get more space. Want to receive lots of compliments from the stranger while walking on the road than this gorgeous-looking “McKlein USA W Series Lake Forest Bag” is here to help you. It is one of the best designer laptop bag for women you will ever own. The design of this bag is so flexible and well organized that you will never get lost while trying to find your important paper or electronics. This fashionable laptop bag is made of Italian leather. The bag features a U-shaped zipper in the front to keep gadgets like Pens, iPads, Tablets, etc. The top zip compartment gives you an easy access to the main section with file divider. Inside of the bag, there is plenty of room for a laptop, its charger, some DVDs, and other accessories. This Italian leather laptop bag protects laptop up to 15.4 inches with a removable high-density sleeve. This Italian leather laptop bag also features double tabular straps on the both sides of the bag to wear it on the forearm. The shoulder strap of the bag is adjustable and matching. Now you might think what’s up with the adjustable shoulder strap. Let me tell you its one benefit, if you live on the north, then obviously you have to wear a large coat in the winter season. Now imagine you have a designer laptop bag with shorter shoulder strap, will it fit? But this big will fit perfectly because of its adjustable shoulder strap. This gorgeous leather laptop bag for women comes in six different colors: Black, Red, Aqua Blue, Green, Orange and Pink. External U-shaped zipper pocket for goodies like external hard disk, glasses, etc. Q.1 Does it have padding inside to protect my laptop? Answer: Yes! This modern laptop bag features well-padded laptop compartment. Q.2 What about the quality of this bag? Answer: It is pure Italian leather laptop bag. The leather of the bag is soft and the stitching is high quality. Q.3 How heavy this bag is? Answer: Well, this laptop tote bag is a little bit heavy, but I don’t think it will be an issue. Kensington contour balance notebook bag is specially designed for the women. You will love it’s very stylish premium look and lightweight size. Even with the wheels this bag is 25% lighter than any other traditional rolling laptop bag. Kensington contour balance notebook rolling laptop bag is made of water-resistant material. The unique design of this bag offers you to organize your essentials intelligently. This bag features a water resistant external pouch for your ticket, passport or any other essential. It has two side pockets for water bottles with an intelligent and functional design when not in use internal magnet folds it in. And back side has a mesh pocket for other great accessories. The zipper on the main compartment glides smoothly and high quality. The laptop compartment comes with Deep-quilted, impact-resistant and AirBrake bottom cushion that protects laptops up to 15.4 inches. Beside that, there are three other compartments which comes with various sized internal pockets for essentials like pens, sunglasses, iPad, documents, files, etc. This rolling laptop bag allows you to shift all the weight to the wheels. Now you can take as many things as you want to a business trip without worrying about weight. Stop worrying! Start traveling. Plenty of room for goodies like files, documents, magazines, etc. Q.1 Is there enough room to carry 2’ binder and multiple size files? Q.2 How strong the wheels are? Answer: They are pretty strong. You won’t have any trouble in daily use. The North Face Borealis Laptop Backpack is the backpack of professional women. The North Face Laptop Backpack is constructed from imported nylon material. 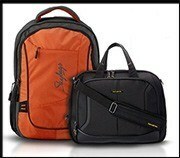 Nylon material is best known for being lightest and durable which makes it one of the best laptop backpack for travel. The North Face Women Borealis Laptop Backpack is available in various colors. It features air mesh covered backside and contoured shoulder straps to fit perfectly in women body. In addition, The North Face Laptop Backpack includes adjustable chest and waist strap to distribute the weight so that you can comfortably carry it on your business trip. The North Face Borealis Laptop Backpack is the best laptop backpack for women who loves organization. At the top, it has fully lined eyeglass zipper pocket for keeping your expensive eyeglass safe and secure. The large front zipper compartment has dedicated pocket for everything you will carry with you. From your iPad/Tablet to cellphones, car keys, pens and lots more. The second large compartment has fully lined and a highly padded section for your 15-inch Laptop. You can also fit your books, files, folders or any other extra thing in this compartment. On the outside, The North Face Laptop Backpack has water bottles pocket on each side. Besides that, on the bottom, it includes superior and easy to clean material. This stylish laptop backpack will stay with you for long years. Q.1 Is it the updated North Face Women Borealis Laptop Backpack? Answer: Certainly, Yes. It is the latest version of the North Face Borealis Laptop Backpack, and it is hundred percent authentic. Q.2 How long it can hold in the rain? Answer: Well, it is a water resistant laptop backpack so it can keep your items safe and dry for twenty to thirty minutes. Among all the designer laptop backpack on this page, The North Face Women Borealis Laptop Backpack is the best laptop backpack for women. It has has everything that a women will look for in a laptop backpack. It made of lightweight material, can protect 15.6 inch laptop, contoured shoulder straps specially designed for women and lots more!! If you are looking for a water resistant and shockproof laptop backpack to show some more love to your notebook, the Bronze Times Laptop Backpack is designed for you. This cool laptop backpack is crafted from canvas and water resistant and shockproof oxford cloth fabric. The Bronze Times Laptop Backpack features padded backside along with padded shoulder strap so that you can easily carry it on your back. In addition, Bronze Times Laptop Backpack includes very durable lightweight top aluminum handle. On the bottom, it has some extra rubber pads so that bag can stand on its own. Bronze Times Premium Shockproof Laptop Backpack offers you three main compartments. The front compartment comes with some more pockets for your cell phones, diaries, etc. The second main compartment spacious enough to hold few books, presentation material, binders or any other things that you would love to carry with you. This chamber also includes a large see-through pocket, if you want to keep anything separate. And the last compartment is for your laptop. The Laptop compartment is very well padded from every side and includes a strap to keep your laptop in place. The Laptop compartment is spacious enough to hold your laptop accessories like the power adapter, external mouse, etc. It distributes the weight very well, so if you own a heavy laptop, you will feel it two or three pounds lighter. Bronze Times Laptop Backpack is one the best backpack for college students. Made of canvas and water and shockproof oxford cloth fabric. Includes some rubber pads on the bottom so the backpack can stand on its own. Q.1 I’m a college student, is this laptop backpack suitable for a college student? Answer: Definitely, yes. You can carry your books, spiral assignment along with the laptop comfortably. Q.2 Does it comes with a chest or waist strap? Answer: Unfortunately, it doesn’t come with a chest or waist strap. Victorinox Harmony Laptop Backpack the most stylish laptop backpack for women ever made for women. This laptop backpack is absolutely elegant with its gorgeous streamlined design that is perfect for women on the go. You can carry this backpack in different ways, you can either use it as laptop tote bag or laptop backpack. Victorinox Harmony Laptop Backpack is crafted from hundred percent imported nylon. Within a second you can convert this laptop backpack into a slim and long laptop tote bag and of course, you can adjust it according to your convenience. And if you don’t want to use backpack straps they tackle away with ease onto the large and roomy pocket on backside. Speaking of pockets, on the front side you will have a medium size pockets for your on the go items like cell phone, airplane tickets, business cards, etc. Victorinox Victoria Harmony Laptop Backpack offers one main compartment that is fully lined. The main compartment has padded section for your 15.6-inch laptop. Laptop section has an excellent snap button to hold your laptop in place. On the other side, there is a padded spot for your iPad/E-Reader/Tablet. The main compartment is large enough to hold your one or two files. The Victoria Harmony will make you look good and perfectly organized. Be sure to Add this backpack to your shopping cart. Q.1 Can I completely remove shoulder straps or the backpack strap? Answer: Unfortunately, you can’t completely remove the shoulder straps or the backpack straps. But you can hide the backpack straps in the back pocket. They specially designed that pocket for this purpose. Q.2 Does this backpack any pocket on backside for sliding in over a luggage handle? Answer: Yes! It does have a pocket on backside for sliding it over a luggage handle. If you are a professional women who need carry a powerful laptop along with the other material, then Laurex Women Laptop Backpack is highly recommended for you. This perfect laptop backpack is crafted from fabric and polyester. The Laurex Laptop Backpack features air mesh covered backside and comfortable shoulder straps. It also includes a waist strap so that weight get distributed and you can carry it comfortably. Laurex also included a comfortable top grab handle for convenience. Access to the bag is protected with modern snap closure. Under the flap, you find two medium sizes zippered pocket that is designed for organization purpose. Here you can keep your cell phone, external mouse, and other bulky stuff. Inside the bag, it has pockets for everything that you would carry in a business meeting or trip. There is two main compartment designed for you. The first compartment is for holding your files, books, presentation material and other things that you would love to carry with yourself. The second main compartment includes a padded section for your 15.6-inch laptop. The laptop section also includes a Velcro strap. On the other side of this chamber, there is the see-through zippered pocket that is a handy feature. The main compartment is spacious enough to house few more things like documents, files etc. On the bottom of the backpack there is a plastic spikey-type panel to keep your bag clean and on the sides, it has a mesh pocket for water bottles. Q.1 Can laptop backpack fit a13 inch MacBook Pro and iPad at the same time? Answer: Well, yes it would fit those just fine. Q.2 Does this laptop backpack have any pocket for water bottles? Answer: Certainly, yes it does have external water bottle pockets. Leaper Casual Style Laptop Backpack is designed for the college students. This stylish laptop backpack for college students is crafted from high-quality canvas and artificial leather. Leaper Laptop Backpack is designed to satisfy all your needs as a college student. It is available in various colors to fit your personal style. Leaper Casual Style Laptop Backpack features padded backside along comfortable shoulder strap. You can walk all day long wearing this lightweight laptop backpack without feeling any pain on your shoulders. It also includes a top handle to hook it up on different places. On the front side of this cute laptop backpack, it has a medium size zippered pocket that is designed to hold your pen, pencils, calculator and other essential accessories. Leaper Laptop Backpack offers only one main compartment that is very spacious. The main compartment has a padded section for your 15-inch laptop along with strap to keep your laptop safe and secure. Laptop compartment includes quality padding all around the compartment. On the other side of this backpack compartment, there is two open sleeve pocket where you can keep your cell phone, wallets, etc. The main compartment is spacious and large enough to hold your books, notebooks, spiral assignments, etc. Leaper Casual Style Laptop Backpack is one of the best laptop backpacks for college students. I highly recommend this cute laptop backpack. Q.1 Does this backpack have any padding on the backside? Answer: Yes, It does have plenty of padding on the backside. Q.2 Will it fit a 15.6-inch laptop? Answer: Of course, it will perfectly fit a 15.6-inch laptop. Among all laptop bags on this page, these three laptop bags are highly recommended, if you are looking for a laptop bag that is stylish, modern and comes with lots of features and functions!! So you just got a new laptop, and you want to show some love to your laptop and protect it in style. A laptop bag is a mandatory item whenever you are thinking of protecting the laptop. Finding a stylish, fashionable, designer laptop bag is not easy. Here are the some tips which you should consider before purchasing a designer laptop bag. Size: First thing you should consider before buying a stylish laptop case is size. Do you want large laptop case? Do you want a perfect size laptop case? These are the question you should ask yourself. If you own a 15-inch laptop, then I recommend you purchasing a 15-inch laptop bag. If you purchase a 17-inch laptop bag for a 15-inch laptop then most probably your laptop will get lot’s scratch because of gliding. So make sure a snug fit. Space: Do you just carry the laptop with you? Do you carry other accessories along with the laptop? If you just take the laptop itself, I recommend you looking at best laptop sleeve as these are very lightweight laptop bag and fits into your need. If you want extra storage for your other essential, you should get the best laptop tote bag, best messenger bag or best laptop backpack as these type of laptop bag has lots of internal and external storage. Carrying option: Last but not least, you should take close attention to the carrying options a designer laptop bag offers. If you like carrying bag using the shoulder strap then, you don’t want to purchase a laptop bag which doesn’t provide shoulder strap, Right? With all these information provided above, I’m sure that you are fully informed about features of best designer laptop bag for women. Using this information you can choose a right designer laptop that will fulfill your need. So what are you waiting for? Buy best designer laptop bag, get on the road and grab all the compliment. And don’t forget to tell me how many compliments you received.